Why is it that all the kings look you straight in the face*except* the king of diamonds? If he's bothering to acknowledge you at all, it's only with a cursory sideways glance. He's the only king, by the way, who carries a big axe instead of a sword. What does that mean? 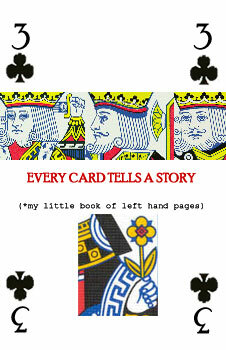 I've also noticed how all the queens hold flowers, but it's only the curly-haired queen of hearts who is left-handed. Her son, the jack of hearts carries a quill rather than a weapon. This could make him a poet penning sonnets of love, or a moustachioed bureaucrat tediously listing his sword-wielding dad's royal assets. Perhaps none of this means anything at all.